“Hey Dakota, I’m looking for retail trends 2016,” Sherine Kazim texted Dakota on her iPhone while the two of us were sitting in a conference room at Huge’s not-so-Huge conference room inside the agency’s DUMBO, Brooklyn headquarters recently. I’m not sure why I call her a she, or even think of her as having a gender -- maybe it’s the exclamation marks she uses to sign off on her texts or that I associate her name as female because of the actress Dakota Fanning -- but the truth is that Dakota doesn’t have a gender. That’s because she -- er, it -- isn’t actually a person. Dakota is a machine. Just some artificial intelligence software developed by a skunkworks team of programmers, natural language-processing experts and experience designers operating in a spartan, startup-like annex separated from Huge’s main offices. “A brain,” Kazim corrected me when I first referenced Dakota that way after she showed me how Huge’s new AI interface works. By brain, Kazim means that literally, although not actually organically, because Dakota was created to function much like a human brain, only better -- faster and capable of processing more variables than anyone’s brain possibly could. Lest your own brain’s neurons take you down a pathway assuming this is just another story about an agency building or licensing some powerful new AI technology, you’d only be partially right. Dakota is a brain Kazim’s team at Huge created to augment and assist the way some human brains function inside and outside of Huge. Specifically, its own workforce and those of its clients. Yes, Dakota is some state-of-the-art AI. And yes, Dakota will only become smarter as her machine-learning algorithms adapt, evolve, and become smarter, better and faster at understanding what the humans she interfaces with need -- but she is actually just a component of a much bigger play, an interface powered by bleeding-edge AI and connected to all the knowledge that sits inside Huge, its clients and the supply chain of information they use to create experiences that interact with other people: consumers. Huge’s design and branding teams have not given a name or a persona to that platform, so I personally think of the whole apparatus as “Dakota,” but the truth is it is difficult to understand where Dakota leaves off and the “end-users” she is serving begin, because the platform also is part of an ever-evolving experience driven by iterative, adaptive and most importantly, “anticipatory design” that has become the core position and point of differentiation of everything Huge does. The platform powered by Dakota leverages and brings those designs to life in ways Huge’s designers cannot fully anticipate themselves, because they depend on interactions from their end-users -- whether they are Huge’s internal teams, their clients, or even a trade reporter being given an early background glimpse of it. It works by asking it questions and having it respond to your specific needs. It’s like an internal, intranet version of Siri or Alexa. It is, in fact, a “conversational interface.” It also is the main reason OMMA has selected Huge as its Agency of the Year this year, because it is anticipating something else: the way its organization, its clients, its supply chain, and if we’re right, the way the whole industry will be working going forward. 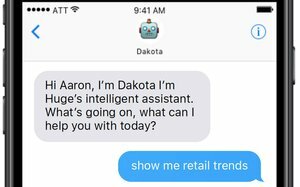 Of all the cases MediaPost and OMMA have reviewed over the years that we’ve been applying our agency of the year awards criteria -- vision, innovation and industry leadership -- Huge’s new Dakota-powered conversational interface is the purest embodiment we’ve seen to date. At a time when most visionary agencies are talking about and beginning to research and even strategize how “conversational marketing” -- a loose-knit descriptor encompassing elements of AI, chatbots, messaging interfaces, etc. -- will change the way consumers interact with brands, Huge has actually built it. And is deploying it right now. Even more ingenious is the way it is deploying it: As an internal resource enabling it -- and most importantly, its clients -- to work better, faster and more frictionlessly than they could without it. That’s ingenious, because what client wouldn’t want to retain and commission Huge to build its own consumer-facing version of that conversational interface after experiencing how it improves their own workflow and services their needs. That’s the bet Huge chief Aaron Shapiro made when he authorized the development of Dakota, and an API-based platform that would power the way the agency and its clients “converse.” It’s not an inconsiderable bet. At least seven-figures has gone into the development of Dakota and supports Kazim’s team of designers and developers bringing her to life. But she’s already beginning to affect life as Huge knows it. The agency has already opened the platform up to other teams within Huge to develop new APIs to improve internal and external processes by making them much more conversational, intuitive and frictionless. During a recent weekend hackathon at Huge HQ, for example, a team developed a new conversational interface for processing expense reports simply by talking to it. The voice-controlled interface, which the Huge team dubbed “Expensify,” guides Huge employees through voice-activated, conversational steps for inputting their expense report data, including dates, amounts, receipts, etc. The application is important for a couple of reasons, including that it demonstrates how Huge’s organization is beginning to adapt and iterate on top of Dakota, but also because it is the first voice-enabled interface tapping Dakota, whose initial release is primarily text- and email-based. Kazim says that was on purpose, because most of Huge’s team and its clients are most comfortable having conversations and interactions via their smartphones, but her team is already developing voice-based interfaces that will facilitate every facet of the way they work within Huge -- from expense reporting to HR to project management to research to interacting with clients. Obviously, that last part is a Huge sampling opportunity for Huge’s new baby, but even if it doesn’t yield direct new business projects from the initial rollout of Dakota, Shapiro believes it will generate immediate returns for the Interpublic agency in two ways: One, it will enable them to improve internal workflow and become more efficient and less labor-intensive in servicing clients; and two, it enables Huge to practice what it preaches, serving as a living laboratory for testing, learning, adapting and evolving the kinds of experience designs its pitches to its clients and potential new ones. This time, Dakota is slower to respond as she thinks about it -- about three seconds -- and then replies, “Sarah Jones VP User Experience Research… you can reach her at…” and then provides both the email and phone number, as well as a thumbnail photo of Jones. The point of that exchange isn’t that Dakota is all-knowing. It’s that she was designed to be as relatable to human beings as possible, and that her true role isn’t to replace human functions, but to augment, support, make them better, and in the case of connecting Kazim with Jones’ team, to actually facilitate them more efficiently. During our briefing, Kazim and I joke about the scary aspects of fast-evolving AI technology, including recent pitfalls (like Microsoft’s infamous Tay tests that led to hate speech being auto generated in social media feeds), as well as anxiety that it would someday disintermediate humans altogether. Pointing to Tay as an example, Kazim says it is proof why AI will never completely replace the functions of people. Like other AI developers, Kazim says her teams is constantly working to improve Dakota’s ability to “measure people’s emotions and sentiment” in order to process information in ways that are more natural and intuitive to people, but she doesn’t believe it will ever evolve to the point that it can actually think like humans, because the purpose of AI is to serve humans. “AI can’t exist unless humans exist,” she says. Phew, for now, anyway. I for one will be keeping an eye on Dakota. In the meantime, she will be attracting more eyes to Huge.